Happy Onam! 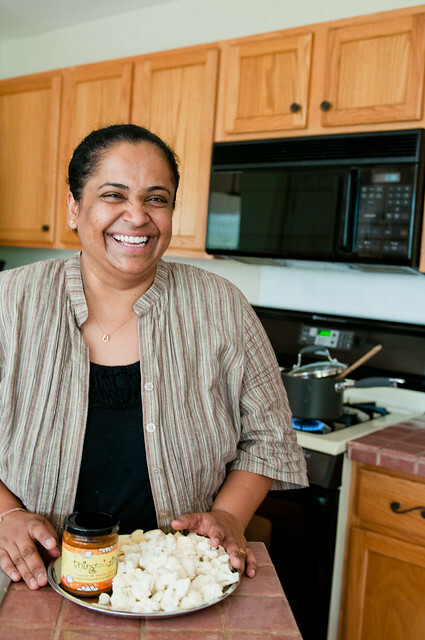 And, thank you for the great feedback and comments on In The Kitchen With Vinita, Part 1! One of the things I really like about Vinita is that she's always ready for a cup of chai no matter how hot it is, indoors or outdoors. Yes, rather like me! Vinita was brought up in the steel city of Jamshedpur but her roots go back to the Palakkad District of Kerala. The traditional ishtu or stew from this region is a simpler version of the Kerala Ishtu that Asha Gomez had made at my workshop, Culinary India, in June. This Palakkad ishtu is one of Vinita's father's favorite dishes, she explained as she quickly peeled the boiled potatoes. Onam sadya was considered incomplete without this vegetarian potato stew. You have to smile right back! Vinita has an infectious smile and a charming extroverted personality. I am lucky to be able to call her a dear friend. Not just because she personifies exuberance but because she's beyond amazing. Vinita is an audiologist by profession but a food entrepreneur by choice. 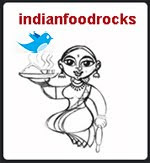 She is the mastermind behind Thing with a Zing, where she creates, bottles and sells Indian chutneys. These are not anything like British chutneys in which vinegar plays a key role in the flavor profile. As she puts it, her chutneys are a bold flavor for your senses in the true sense of the word. 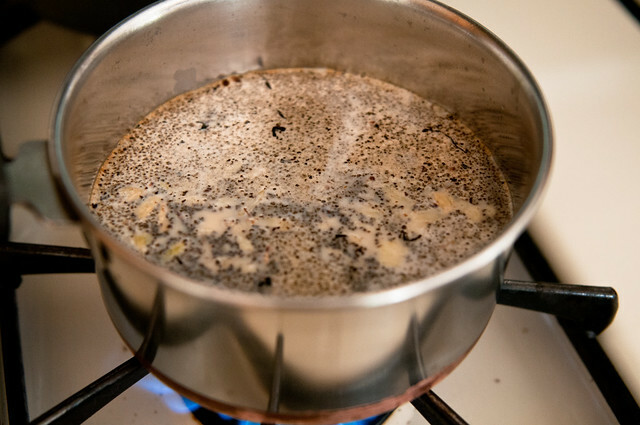 Her chutneys can be found in several stores in the Denver-Boulder area, like Whole Foods, Alfalfa's, and a couple of other natural grocery stores. One of the privileges of having a friend who jars tradition with a unique twist into an edible treat, is being able to taste her creations before they hit the market. 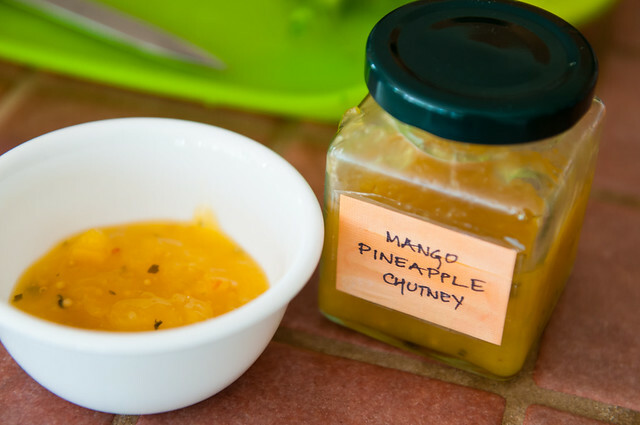 I love pineapple, I love mango, I love the combination of spices in this chutney and now, I have a problem. I don't know which of her chutneys I like best. This will be her third chutney, the second one being That Sweet Zing which is a cranberry-ginger chutney. All of them are truly excellent. Furthermore, since Vinita adheres to food safety guidelines, I never have to worry about the quality of her product, including the seal on her chutney jars. This weekend our friend's 15-year-old daughter gave a private two-hour Bharat Natyam recital at their home. Her performance was beyond brilliant as she wove stories through her graceful movements, gestures and expressions. The light was difficult and I wish I had the patience to energize the two doors in the background into oblivion using Photoshop. But I will not complain because this was a performance to be cherished. It's been a rough three weeks. My carpool buddy developed sepsis from an undiagnosed infection and is in her third week of hospitalization. She is recovering but it will be a while before she can return home. People went to watch the premier of a movie in Aurora not knowing that their lives would change drastically. This morning a Sikh temple was the target for reasons beyond comprehension. Life changes in an instant. We're here now. Make the most of every moment. Keep your loved ones close, enjoy your friends and reject all forms of negative energy. I went to another Mile High Food Swap today, a welcome distraction. It was hosted by Isabelle Farm, an organic farm in neighboring Lafayette. Isabelle Farm leases the Thomas Open Space from the City of Lafayette where they grow tomatoes, peppers, eggplants, cauliflower, broccoli, kale, squash, okra and many other vegetables. The farm also has a CSA that runs for 20 weeks between June and October. Tiffany Carpenter gave us a tour of the farm and explained how the people of Lafayette had voted for an organic farm instead of yet another golf course.